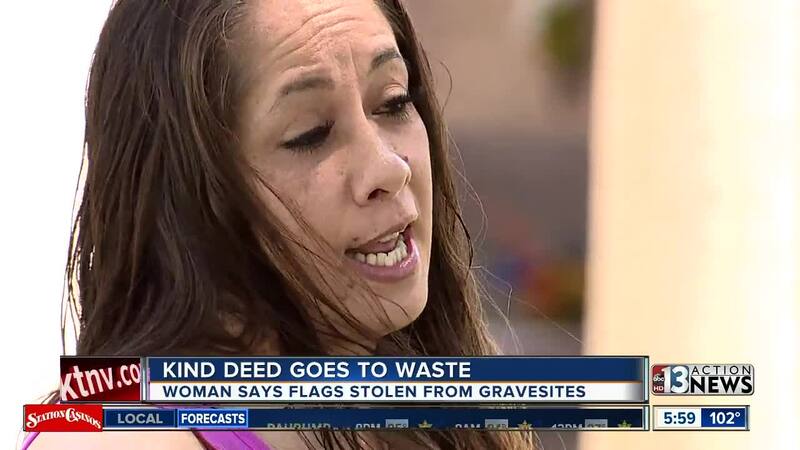 A valley woman says her patriotic kind deed went to waste when the U.S. flags she planted were removed on the 4th of July. Austin Carter reports. A local woman says her patriotic kind gesture went to waste when the U.S. flags she planted on graves were removed on the 4th of July. There’s not a day goes by that Shannon Reed doesn’t think about her best friend Veronica. "It's been three years now, so I like to come out and pay my respects,” says Reed. Veronica was laid to rest here at Palm Boulder Highway Cemetery. It's a frequent visit for Shannon and this year for Independence Day, she wanted to do something for everyone so they knew they weren’t forgotten. With help from her son’s girlfriend, Reed placed 150 miniature U.S. flags at all the nearby gravesite around Veronica’s. But, when Shannon showed up to the cemetery on the 4th of July, they were all gone. "I was just doing a kind gesture so for you or whoever to take it down it's just not right." Shannon now feels heartbroken and says the flags were meant to honor those who are no longer with us and couldn't be with their families today to celebrate our country. "This holiday is for a reason. It's not just because we're going to do fireworks or barbecue, the 4th of July is to celebrate that we're proud to be Americans and there are a lot of people fighting for this country. And my son is one of them. 13 Action News stopped by the cemetery’s office to try and get an answer as to what happened to the flags.